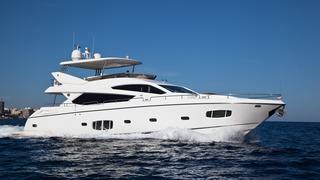 The 24.4 metre motor yacht Nirvana Blu has been listed for sale by West Nautical. Built in GRP by UK yard Sunseeker International, she was delivered to an experienced yachtsman in 2011 as a Sunseeker 80 model. Accommodation is for eight guests in a master suite, VIP suite and two twins, all with entertainment systems and en suite bathroom facilities. The main saloon is finished in black American walnut and comes with settees to port and starboard plus comfortable armchairs, all finished in oyster coloured leather. There is also a wine cooler cabinet and an entertainment centre including a 46 inch Samsung television and a Bose cinema surround sound system. Nirvana Blu comes with every possible extra option including an upgraded engine monitoring system, a water maker, upgraded generators, tropical air conditioning and underwater lights to name but a few. Her large flybridge is made for al fresco entertaining, offering a wet bar, electric barbecue, teak decks, Bose surround sound, sun pads and seating along with a custom hard top. This area also has a crane for retrieving the jet ski of this yacht for sale. She also boasts an extensive cockpit fully equipped for outdoor entertainment with U-shaped seating around a teak table. Twin MAN 1,550hp engines give her a cruising speed of 26 knots and she is fitted with a Trac Star digital fin stabilizer system providing full roll control at speeds above 13 knots and significant roll reduction while at rest. Lying in Malta, Nirvana Blu is asking €2,450,000.